It's become a tendency to look at a team that just won the Stanley Cup as if it has unlocked a secret for success in the league. Depending on the year and who won, you either need to have strength down the middle, or solid goaltending and defensemen. Maybe you need to have size and skill, or possibly just a well rounded game with speed. Of course, looking at what the reigning champs did to get there and trying to emulate it is a losing proposition. There are many ways to win in the NHL and each roster has its own unique identity. Pieces need to be added to that enhance the ability of a team to play its game, not as a result of whatever is trendy. Despite this, there are times when you see another team in a familiar position, with a similarly constructed roster, go on to win the Stanley Cup with slightly different methods. Looking at both team's rosters, Chicago and Pittsburgh share a decent amount of similarity. Both teams have deep lineups with relatively strong 3rd and 4th lines. Both commit a significant portion of the salary cap to two elite forwards, with Pittsburgh's duo (Crosby and Malkin) being more talented than Chicago's (Toews and Kane) but likewise taking up more cap space. They have similar production and talent in the secondary scoring, and both like mobile defensemen who can add some offense. And before this season, both teams had recently won Stanley Cups with Pittsburgh taking it home in 2009 and Chicago following up with their own the very next season. Following their wins, both teams took different paths to building and maintaining their teams. Ray Shero, at least in the years immediately following the Cup win, was able to keep the young talent together. Stan Bowman was forced to lose out on an enormous amount of young talent, partially due to $5 million in bonuses resulting from the Cup win that put them $4.2 million over the salary cap, a penalty they needed to repay the next season. Antti Niemi left for Chicago and has developed into one of the better goaltenders in the league, earning a Vezina nomination during the 2013 season. Andrew Ladd and Dustin Byfuglien were traded to Atlanta and are both playing major roles for Winnipeg. Kris Versteeg has posted a couple 20 goal seasons since leaving Chicago, and others players have found serviceable roles elsewhere. Despite losing enough talent that would cripple most of the teams in the league, Chicago found itself raising the Stanley Cup for the 2nd time in 4 years, and they did so with arguably the deepest and most talented roster in the league. While Ray Shero managed to keep the core intact at first, the past couple offseasons are eating away at what remains from the championship roster. He was proactive in trading away Jordan Staal last offseason and got 3 high quality young player in return. It appears this offseason he's going to follow with another blockbuster trade involving Kris Letang. Ray Shero is one of the best GMs in the league and deserves every bit of the recognition he received when he was named GM of the Year by his peers. Yet this is a situation he hasn't had to face, and he would be wise to look back at how Bowman handled the salary cap aftermath for guidance. With the need to trim salary, Scott Bowman traded as many players under contract as he possibly could. These moves turned forward into a position of organizational strength, giving Chicago reinforcements down the pipeline to help replace those they lost. Bowman continued his commitment to his defense he began by extending Duncan Keith by matching a 4 year, $14 million offer sheet to Niklas Hjalmarsson that appeared to be too expensive for Chicago to afford. During the following season Brent Seabrook was given a big money extension as well, and Chicago suddenly had a formidable trio of young defenders locked up. Antti Niemi's fate hinged upon the Hjalmarsson offer sheet, and when Chicago matched they were forced to walk away from the $2.75 million the goalie was awarded in arbitration. Bowman signed a cheap stopgap in Marty Turco, and it became clear Chicago was going to develop Corey Crawford and hope he could become their starter of the future, a move that has paid off as Crawford posted a 0.926 save percentage and 1.94 GAA in the regular season and a 0.932 save percentage and 1.84 GAA in the postseason. Chicago was able to keep many of its high priced stars, survive the salary cap nightmare they found themselves in, and become the President's Trophy and Stanley Cup winning team in 2013 because of key contributions from younger players on cheap contracts. Brandon Saad might have cooled off during the playoffs, but he was a key member of their regular season success, finishing 4th on the team in points and earning a Calder Trophy nomination at a cap hit of $900k. Brian Bickell finished 2nd in postseason scoring yet only carried a cap hit of $540k. Andrew Shaw and Marcus Kruger chipped in on a talented bottom 6 for less than $1.5 million total. Nick Leddy played every game the past 2 seasons and rounded out the blueline as the 6th defenseman at $1.1 million. By playing young, cheap, and talented players Chicago was able to afford to keep Patrick Kane, Jonathan Toews, Patrick Sharp, Marian Hossa, Duncan Keith, Brent Seabrook, and Niklas Hjalmarsson at a combined cap hit of $38.6 million and still have enough left over to fill out the rest of the roster AND be the best team in the league. We're already starting to see Shero take a similar approach as Bowman did, except with defense as the position of organizational strength. He has Crosby, Malkin, Neal, and now Kunitz locked up long term with Beau Bennett under RFA control as well. The next move you'd imagine would be locking up Pascal Dupuis to finish securing the top half of his forward depth chart like Bowman did with his defense. Shero moved Jordan Staal last summer and now has a very good NHL player in Brandon Sutter and 2 very good prospects to show for it. A Kris Letang trade would further help to replenish the prospect pool, and it's time for Bylsma to start focusing on developing the young defensemen who are ready to start getting playing time. Simon Despres deserves a spot on the 2nd pairing, Robert Bortuzzo should get a place on the 3rd pairing, and it sounds as if Brian Dumoulin is poised to make a run at a roster spot as well. After this offseason the top priority needs to be searching for a potential goaltender of the future, as the combination of Fleury's play and salary will result in a trade or buyout next year if something doesn't drastically change. Stan Bowman has shown that you can gut a team of a lot of talent and restock it in short order, and Ray Shero has shown he's among the best in the business at making moves. 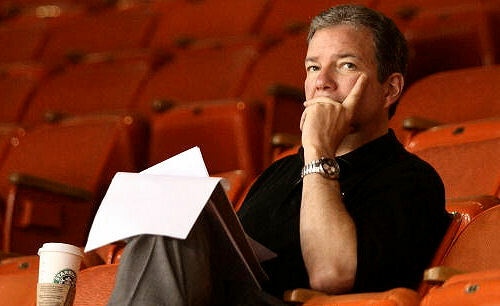 Now it's time to see how Shero's plan unfolds.